Smartphones are a great way to organize your life. They are essential for quick communication and for important reminders. On the other hand, smartphones are also a great way to get distracted and forget your priorities. 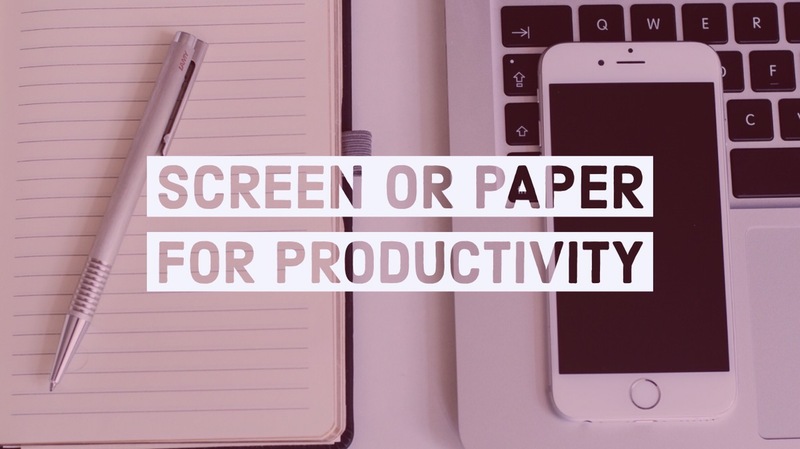 In this article we will investigate where a paper notebook is still better than a smartphone for your productivity. Laptops allow us to type much faster than we write by hand. That’s because our brain can turn typing into a mechanical task. We can do it without thinking. When it comes to handwriting, our brains work a little bit different. In a study called “The Pen Is Mightier Than the Keyboard”, scientists have found that transcribing notes doesn’t help learning. Instead, processing the information and framing it in your own words creates better memories. A similar survey of students across 10 countries concluded pretty much the same. Taking notes on a laptop resulted in forgetfulness. Taking them by hand led to memorizing and learning. In neuroscience, this is called tactile memory. When you use a keyboard – typing an “S” is the same as typing an “A” and your brain can’t process the difference. But when you write by hand, your brain treats an “S” very differently than an “A”. This is why your brain remembers twice as better if you write down something as compared to typing it. What you’re actually doing is activating one more type of memory. In addition, as some have found out, using a paper notebook to write meeting notes and using a paper planner to plan the day makes it easier to remember what you wrote down. NFL’s longest-tenured active head coach, New England Patriots’ Bill Belichick, was filmed slamming his Microsoft Surface tablet during a game. He then went on a five-minute rant explaining his action. He said that unlike paper, tablets were both too unreliable and too limited. His main reason – that Sketching is simpler and more flexible on real paper. Just take a planner and start writing, drawing, scribbling. Anything you like in any arrangement imaginable. Your brain will do the rest. Sure paper is perishable. But it is predictably perishable. Data turns to noise in all kinds of unpredictable ways. Like hard drive crashes. And if an IT person tells you that there is a way to archive a digital file, not touch it for 500 years, and guarantee that it will remain usable—that person is lying to you. If you think I’m wrong, I’ll email you some WordStar and AppleWorks documents just as soon as I can figure out how to get them off my five and a quarter inch floppies. Now, why change something if it’s so good that people kept using it for centuries? Computers are made to multitask. But humans are terrible at multitasking. Yet, using a smartphone almost always means being forced to multitask. The planner apps themselves are developed in a similar manner. Just think about it. You’re never merely taking a note. You’re also choosing what kind of a note it is so that it is categorized properly. You may also want to change its size and color to make it more prominent. Or download a new icon to illustrate it. And before you know it, you’ve spend fifteen minutes taking a simple note. And all this, while a caller is on hold. Which will ring again in few minutes. Which will notify you of unimportant app updates twice in the next hour. Yada yada yada. I’m sure you know what I mean. This doesn’t happen with a simple pen and paper. And she’s right: screens disrupt sleep, and they aren’t good for your eyes either. Pens and planners have no such effect. After all, when was the last time you were awoken by brightly blinking paper? I find that paper notebooks still beat smartphones and laptops when it comes to reflective Journaling, Planning the Day and doing Weekly Reviews. Having said that, I don’t want to discount the importance of digital devices. My iPhone and my Macbook are critical for my daily productivity. All my appointments and special events go into Google Calendar. I set automatic reminders so I don’t need to remember it in my head. Plus, pictures and work files are stored digitally “in the cloud”, so that I can access them from different locations using different devices. Yes, I’ve been using a simple 8.5 x 11 notepad for years. Each morning I start with a new page. I make a list of things I need to get done that day. I also used the empty notepad in the past. But I switched to a custom designed planner in 2015 to give myself a more predictable structure. Though it doesn’t solve the multi-tasking problem and National Archives challenge, I have found my Pencil with large iPad Pro (definitely has to be both, the iPad alone doesn’t get it done) to be one of the best tools I have at my disposal (even better than excel…). I am about 99% paperless and love the anytime access to about anything that a connected device can offer. The pencil gets me back to my design roots while satisfying the inner geek. Thanks for sharing your experience Teresa! I didn’t try the iPad Pro + Pencil option yet, but heard positive reviews. Do you use a specific app to take your notes?